The Darien high school gymnasts hit the Friday night heights in their tri-meet with Oxford and Wilton, earning their highest team score of the season with 127.10, a two-point improvement over their previous best. Though Class M defending state champ Wilton, with 134.95, and Oxford with 129.9, outscored the Wave, Darien has steadily improved through the season. Junior Lana Schmidt and senior tri-captain Lily Fairleigh earned their highest All-Around (AA) scores of the season to place fourth and sixth while freshman Megan Cutler ranked eighth. 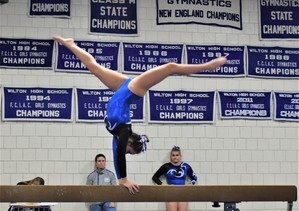 Wilton senior Jessica Olin compiled a 36.00 for the top AA score. The Wave started on bars, where Fairleigh landed her cut catch release to earn the top team score. Lana Schmidt sailed through her switch kip and scored just a tenth lower. Smooth swinging routines from Cutler and sophomore Lucy Collins also contributed to the team score. With junior bars star Kerry McDermott hoping to return from injury soon, Darien has the potential to score even higher. In the second rotation, Lana Schmidt scored the team’s first 9.0 of the season for her full-twisting vault, leading the Wave to their season’s highest vaulting total of 34.00, just half a point behind Wilton. Carlo flipped to 8.6 with her tuck Tsuk vault and senior tri-captain Sofia Fea-Ruiz and freshman Sommer Schmidt earned 8.1 and 8.3 for their twisting vaults. Sophomore powerhouse Lauren Grandon had hoped to return to vaulting but tweaked her ankle injury during warm up. On floor for the third rotation, Carlo’s powerful tumbling earned the Wave’s highest score with 8.6. Lana Schmidt closed her routine with a high-flying front handspring to front layout to earn 8.25. Fairleigh and Fea-Ruiz’s entertaining routines with strong acro passes and leap connections also added team points. With three gymnasts scoring over 8.0 for the first time this year, the Wave also topped their previous high score on beam with 32.55. Leading off the final rotation, freshman Maggie Russell set the standard, landing her cartwheel-roundoff combination with confidence. Carlo was steady through her skills, huge leaps and cartwheel to full-twisting dismount, earning the team high score with 8.6. Lana Schmidt nailed her back-walkover to back handspring connection for 8.25 and Fairleigh’s soaring leap combinations earned 8.0. Though Cutler wavered on her new back handspring element, she was steady through the rest of her skill-packed routine to add team points. Fans are invited at cheer for the Wave gymnasts at their upcoming Senior Day meet against Trumbull and Staples. Saturday, Feb. 2 ad 2:30 pm at the Darien YMCA. Admission is free.